All cars get chips in the paint. How often are you getting car paint chip repairs in Reno? If you want to minimize your car paint chip repair frequency at Reno auto body repair shops, there are some actions you can take. If you take care of your car’s exterior, you may be able to avoid car paint chips in Reno. Reno car repair shops can perform car paint chip repair on specific areas. The cost of a car paint chip repair in Reno will vary depending on if you go the DIY route or if you take it to a professional. Car paint touch up pens can be found cheaply, and car paint chip repair kits can cost anywhere from $10-$70. Car paint touch up repair kits can be a good option if you have enough knowledge to perform a car paint chip repair safely. If you don’t want signs of car paint chip repair to be noticeable, take your car to an auto body repair shop in Reno. Professionals can diminish the appearance of the fixed area and can do a much better job at paint matching for your car paint touch ups. There is a very real cost to not getting car paint chip repair in Reno. If you don’t repair chipped paint on your car, you can expose your car to rust. Rust makes your car troubles far more damaging and expensive to repair. If you want to go the do-it-yourself route, there are some tools you will need for car paint chip repairs. 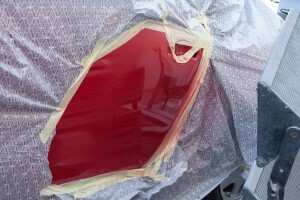 Your first step in DIY car paint chip repair is cleaning the affected area. You want the chipped paint area on your car to be clean before you attempt to cover the area with paint. Was the chipped paint area on the car with soap and water and dry with a clean cloth. Rub the area with rubbing alcohol. After the area is clean, the next DIY car paint chip repair step is to remove any loose paint chips. Loose paint chips on your car will come off eventually, so it is best to remove them carefully before sealing the area. If you do not remove the loose paint chips, you will end up with more car paint chips in the same spot in a month or two. Once the chipped paint area on your car is clean and uniform, you can apply primer and color paint. The paint color information can be found as a code on a sticker on your car door. Liberty Collision can help you with car paint chip repairs in Reno. There are different types of car paint chip repair kits you can buy. Some auto body repair websites offer car paint repair pens to perform touch ups on your car. The car paint touch up pen can work well for scratches, but chips in car paint are another story. A car paint chip touch up pen will only work on areas smaller than a pencil eraser. You will want to look for a car paint chip repair kit that has more coverage than a simple pen. Other car paint chip repair kit options in Reno include touch up paint spray cans and brush bottles. These options just cover the paint selection for touching up the chipped paint areas. Car paint chip repair kits also include wax and grease remover, rubbing compound, and primer. Car paint chip repair kits and DIY car paint chip repairs will only work on recent chips. If chips in your car paint have already started to rust, you will want to take your car to an auto body repair shop in Reno for car paint chip repair and rust repair. At Liberty Collision, we provide efficient car paint chip repairs. As an auto body repair shop in Reno, our team knows how a simple car paint chip can escalate into something much more costly. Don’t wait to have your chipped car paint repaired. Stop by Liberty Collision auto body repair shop in Reno today for an estimate!